Maverick showwoman Marisa Carnesky has been challenging, upending and redefining ideas around cultural identity, popular entertainment and ritual performance for more than 20 years. In productions like Jewess Tattooess, Magic War, Carnesky’s Ghost Train and Carnesky’s Tarot Drome, she has powerfully melded personal history, female performance heritage, supernatural archetypes and matters of the flesh, fusing fairground wonders and feminist critique. Ben Walters: We've been hearing a lot about the demise of Soho lately but you've just opened a pop-up venue on Manette Street and your new show is at Soho Theatre. What do you think of the state of Soho in 2016? Marisa Carnesky: I am very saddened by the loss of some iconic venues in the area like Madame JoJo’s and the 12 Bar but excited by new, albeit short residences and pop-ups like You Me Bum Bum Train in the front of the old Foyles and us – Carnesky’s Finishing School (CFS) – in the back! 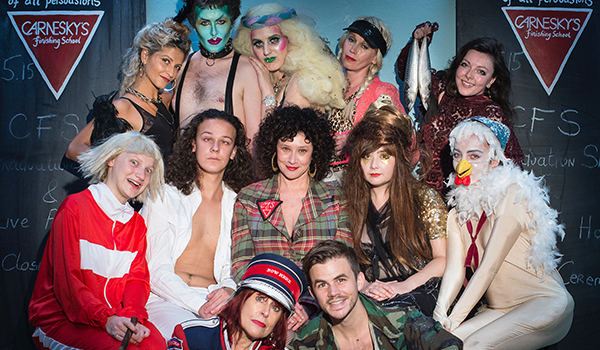 Soho Theatre goes from strength to strength with a great line-up of new theatre, cabaret and comedy and CFS hopes to be part of Soho continuing what we feel makes London great: extraordinary, independent arts projects, queer culture, alternative music, subculture, nightlife, independent creative and quirky businesses. Soho has been a big part of my personal cultural landscape and holds many memories for me, from going to Gossips nightclub in the late 80s to hiring the then Raymond Revue Bar in the early 90s and putting on a series of performance events with an arts collective of that time, the Dragon Ladies. I hope with creativity and ingenuity more arts projects and creative businesses can thrive in this historic and important cultural London neighbourhood. Ben: What exactly is Carnesky’s Finishing School (CFS)? Marisa: CFS is an alternative to traditional stage schools as well as a pop-up live cabaret performance venue in the heart of Soho. It’s run in partnership with Bethnal Green Working Men’s Club and includes a gallery of John Lee Bird’s portraits of performing artists. I’ve been running workshops alongside my performance projects for over a decade in universities, arts centres, at the Roundhouse and Bethnal Green Working Men’s Club. I always dreamt of establishing my own space for it. I’ve been obsessed with the idea of stage schools since attending them as a child – I loved the movie Fame and I’ve always had a vision of wearing lots of beads and leading strange, esoteric and politically motivated theatre and movement classes. I feel it’s in my blood. In fact, it seems a lot of renowned London stage schools were led by Jewish grandes dames: Sylvia Young, Anna Scher… I aspire to be the tattooed avant-garde queer version! In essence I love working with people to help them realise their vision and guide them into the London arts scene. Guiding someone on the cusp of realising their performance language and identity and taking them through to performance have been some of the most rewarding experiences of my career and I hope to continue this work for many years to come. You come to CFS to do an evening course or five-day workshop with me and my exceptional co-tutor Lisa Lee (of the LipSinkers and UnderConstruction), or a weekend workshop with an amazing programme of theatre, cabaret and live artists we’ve invited in. You can be any age and have no arts experience or lots – the courses can work for people on many different levels. The approach is relaxed and creative – we lead by the carrot, not the stick as in some established theatre training schools in Europe. We don’t make people feel humiliated or stressed to find their performance. Our ethos is to get the best out of people through inventive and original workshops that mix a variety of traditional, experimental and contemporary training and devising approaches. We offer further opportunities to perform the work in the venue as part of a programme of evening talks and performances. We invite our colleagues and contemporaries to see the shows and encourage them to programme and collaborate with the emerging artists. We facilitate opportunities for people that come to the courses to socialise in the space and make new friends and build collaborations and forge new artistic scenes. Ben: Why do you think we need unorthodox educational set-ups like CFS in London today? Marisa: Traditional arts education in the UK seems to be in a bit of a fix. Doing an arts degree means, for most people, facing years of debt. Many of the theatre degrees have shifted away from focussing on devising and practice and placed a heavier emphasis on theory. Arts centres offering affordable or free access to resources tend to offer them to young people only so doors are shut to people aged 25 and over who often need access to these resources the most to get their careers off the ground. And stage schools that are skills - and practice-based might not recognise or focus on experimental, political or new practices in theatre in cabaret. So we need to create theatre training that’s practice based, affordable, open to the people who need it, and up to date with current performance practice and politics. That is what we’re trying to do at CFS. 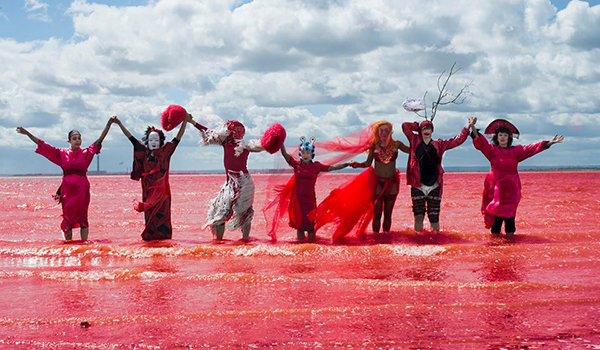 Ben: Dr. Carnesky's Incredible Bleeding Woman is billed as “putting the magic back into menstruation”. What is that magic exactly? How and why did we lose sight of it? And does it have any bearing on the festive season? Marisa: I’m so excited about my new project. I’ve worked closely with the research of the Radical Anthropology Group at UCL, London’s longest-running evening class. Their research suggests that the very the origins of magic in human culture can be traced back to groups of menstruating women spending time together during the dark moon creating rituals of rebirth and renewal. Looking at world mythology, it seems there are many menstrual figures hiding just below the radar like Medusa and Kali that represent this cyclical bodily change. Perhaps witches originated from groups of menstruating women. There has been a lot of great activism around the globe around menstruation in the last few years. The idea of menstruation as taboo – an illness or something negative and dirty to be denied, to feel shame over – is being rejected by women. I’m interested in the rich and hidden cultural power of menstruation and how we can turn round negative patriarchal repression into a realisation that matriarchal human rituals of bodily renewal could be the key to living with the planet, not against it, to realising the power of the body is magic itself in line with the turning of the planets. Stage magic has always been preoccupied with cutting bodies up and putting them back together again, especially women’s bodies. Dr. Carnesky’s Incredible Bleeding Woman looks at theories around these origins of magic and uses stage magic to illustrate and undermine misogynist appropriations of magic in all its forms. This is of course totally fitting for the Christmas season as it could be seen that the stigmata and resurrection of Christ were an elaborate appropriation of early human menstrual rituals of bleeding and rebirth. We also have stunning sequinned showwomen performing spectacular taboo-breaking acts. Now that’s what I call a bloody magic Christmas show! Ben: The show includes a series of rituals from some great artists. What sets a ritual apart from a mere performance? Marisa: The cast features amazing performers Fancy Chance, Missa Blue, H Plewis, Rhyannon Styles (Run Riot Interview, 2013), Nao Nagai, Molly Beth Morossa and Priya Mistry. We created these performances by meeting every dark moon at Metal in Southend-on-Sea for three months through a process that included group devising exercises, meditation, spell casting, dream diaries and life stories around bodily transformation and change. We then performed the ritually-devised performances on the dark moon in the landscape around us. We refined the essence of the pieces into cabaret performances. Over the time we perform these works we are reigniting the magic that we used collectively to create them. All theatrical and cabaret performances in general are, in a sense, rituals because they live in a specially designated time and space that lives outside of daily routines. We have taken this a step further, creating them ritualistically and, in repeating them onstage, reaffirming their power. In fact, some strange synchronising outcomes occurred within the group that could be correlated to the process. The show reveals all. Because we are different women in different ways, exploring menstruation had very different connotations within the group, including childhood shame, physical pain, fertility, miscarriage, transgender identity, menopause and religious ritual. We tried to find performance language that could embody our experiences. 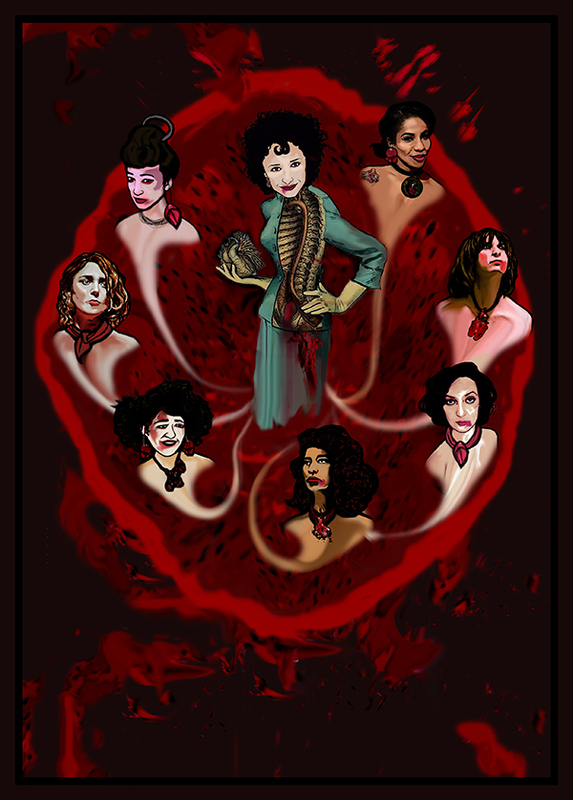 We are experimental cabaret artists with different stage skills, so we made our rituals using our skills to make some thrilling ritualistic short-form performance that connects to cabaret traditions and explores with humour and pathos ideas of women as sexual and provocative entertainers. Ben: The show is also a piece of activism, and you've been engaged with the protests around the proposed Polish abortion ban. How do you think performance and campaigning intersect? Marisa: Activism and performance have long gone hand in hand. Using performance in campaigning and protest is of paramount importance to ensure visibility in this scary time when bigotry rears its horrible head in the form of attacks post-Brexit and a rise in racism, sexism and homophobia. I think, as many others do, that we must use our theatre to get out and show the world that will not be silenced or threatened. We must use our campaigning and visibility to be activists to affect change and expose backward policies. After showing the work as a preview at Duckie and the Radical Anthropology Group on International Women’s Day this year, many people in the audience asked if they could get involved in the process revealed in the show and create menstrual rituals as activism with us. So a group of artists, anthropologists and audience members started the Menstronauts. We meet every dark moon and perform activist rituals that engage with re-addressing all disrespect and abuse of women’s rights around control of our bodies and celebrate the power and importance of recognising the bodies cycles. This month, we showed our solidarity with the Black Czerny Protests against medieval-style abortion laws being proposed in Poland. We meet for a making and plotting workshop on Saturday 22 October at CFS and will perform an outdoor parade, followed by a performance night in Soho on the next dark moon on Sunday 30 October – check our Facebook group to get involved. We welcome women at all life stages, people who identify as women and people who have menstruated but may no longer identify as women. We welcome men to support us on our actions but the meetings are focussed for women and past and present menstruators! Ben: Anything else we should know? Marisa: CFS starts a series of weekend courses with radical performance practioners and tutors kicking off with the amazing Lucy McCormick this Saturday (she's also soon to have a run at Soho Theatre herself). Followed by the one and only Scottee with a really exciting new workshop designed specially for CFS on October 29 and 30, then we’ve got more special workshops with Tim Spooner on November 5 and 6 and the LipSinkers are taking over on November 12 and 13. Further dates are to be announced for workshops with Rhyannon Styles, Feral Theatre, and Owen Parry. With the help of the Bethnal Green Working Men's Club, the space transforms in to an alternative subterranean cabaret venue every night. Tuesday nights are CFS Alumni showcases of new work developed at our school, Wednesdays will see stalwarts of the alternative cabaret scene giving talks or opening up in conversation; guests to include Miss Behave, Chris Green, Jonny Woo, Jo King, Amber Butchart and many more. Friday and Saturday will be programmed by the Bethnal Green Working Men’s Club and on Sunday nights our head girl and boy, aka Queens of the Underworld, are hosting Soho's only avant-garde open mic night. Carnesky's Finishing School - get involved. The Menstronauts will be on the prowl on Sunday 30th October starting at 4pm, at Carnesky's Finishing School. More info via Facebook event page here. CFS is partnering Crying Out Loud and Soho Estates with their support and that of the Arts Council England none of these activities would have been possible.